So, what do you do with a bunch of fresh peaches and a bottle of rum? You get them naked and drunk. NOT the cook, people, the peaches (sheesh, get your minds out of the gutter!) I found a great recipe on Canadian Living's website and decided to try it. 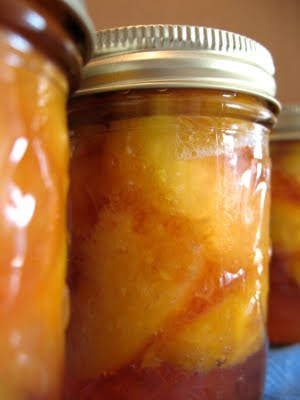 If you have never canned peaches before, it's not really for the faint of heart. There weren't a lot of technical directions on how to exactly DO this recipe, so I'll walk you through it. First, I put all the jars in the dishwasher to get clean and sterilized. I also filled up my canner with water and put that on the stove to get hot. It's always a good idea to have everything out and ready to go before you begin canning. To peel the peaches, I put a small x in the bottom of each with a sharp knife, then dunked them in boiling water for a minute before plunging them in ice water. The skins come of really easy then. Slice them up. To keep them from browning I tossed them with a bit of lemon juice. The recipe gets you to make a sugar syrup, and cook the peeled, sliced peaches in it for about 5 minutes. You then pack them into hot jars, top with some rum, and some of the sugary juice. I found that I actually needed more peaches then the recipe called for to fill the 7 jars, and had a lot of juice left over. They were some juicy peaches! Next you wipe the rims clean, top with hot snap lids and the screw bands, before processing for 20 minutes in a boiling water canner. This part was, for me, the most frustrating. The jars did wonderfully IN the canner, but as soon as I removed them, all the juice boiled and overflowed out of the jars. Okay, not ALL the juice, but a lot of it. I'm not quite sure what I did wrong. If anyone wants to fill me in, please do! Ever scientific Jake believes that it's the addition of rum that is the culprit. They all still had lots of juice, AND they all sealed so even though the loss of some liquid was frustrating, it didn't ruin them completely. If you would like to give them a go, here's the recipe! Let me know how it worked for you.